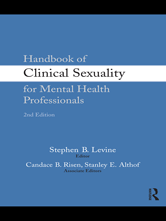 Editors: Levine, Stephen B., Risen, Cadence B. and Althof, Stanley E.
The constantly-changing field inspired the second edition of Handbook of Clinical Sexuality for Mental Health Professionals. In a state-of-the-art guide, Dr. Levine and his associates continue to help professionals with the assessment and treatment of a large array of sexual concerns. Written in a personal, supervisory style, the book will help new therapists anticipate clinical contingencies and help experienced therapists refine their thinking and teaching.